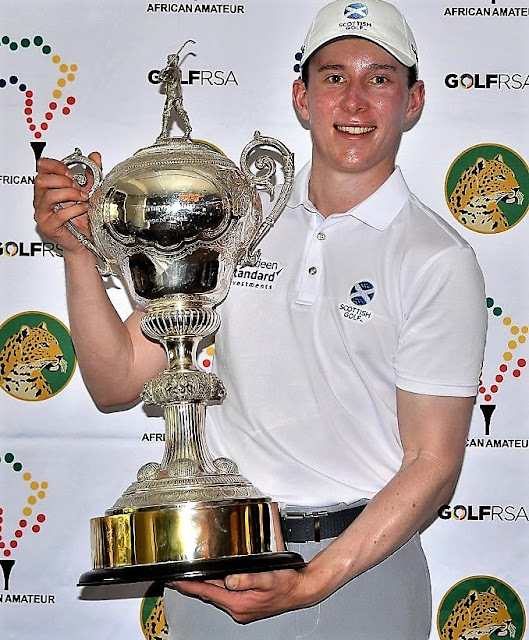 Euan Walker, 23-year-old Kilmarnock Barassie Golf Club member, won the individual title by three strokes with an 11-under-par total at the African amateur stroke-play championship at Leopard Creek. Ludwig Aberg finished second at eight under with Garrick Higgo third at seven under par. Walker held his nerve on the back nine when he survived a wobble that threatened to derail his victory charge. Taking a four-shot lead into his final round, the Kilmarnock Barassie member overcame a difficult spell that saw him drop four shots in three holes, but a solid back-nine, which included an excellent eagle at the 13th, helped Walker on his way to a one-under-par 71. “It feels absolutely amazing because it is something that I have been working towards my whole life, and particularly in the last two years where I have been full-time in elite amateur golf. The quartet of David Langley, Joe Long, Billy McKenzie and Tom Plumb pipped the defending champions and the home favourites, GolfRSA Juniors. England finished on six-under for the three rounds of the team competition, one shot clear of their South African rivals. Highlights of their play included five-under 67s on day two from Plumb and McKenzie, followed by 68 from Langley on the third day and Long’s 67, which pulled them over the line.